Background Cerebral microemboli may lead to ischaemic neurological complications after carotid endarterectomy (CEA). The association between classical cardiovascular risk factors and acute cerebral microemboli following carotid surgery has not been studied. The aim of this study was to explore whether an established cardiovascular risk score (Pocock score) predicts the presence of cerebral microemboli acutely after CEA. Subjects and methods Pocock scores were assessed for the 670 patients from the Carotid Surgery Registry (age 71±1 (SEM) years, 474 (71%) male, 652 (97%) Caucasian) managed from January 2002 to December 2012 in the Regional Vascular Centre at University Hospitals Coventry and Warwickshire NHS Trust, which serves a population of 950 000. CEA was undertaken in 474 (71%) patients for symptomatic carotid stenosis and in 196 (25%) asymptomatic patients during the same period. 74% of patients were hypertensive, 71% were smokers and 49% had hypercholesterolaemia. Results A high Pocock score (≥2.3%) was significantly associated with evidence of cerebral microemboli acutely following CEA (P=0.039, Mann-Whitney (MW) test). A Pocock score (≥2.3%) did not predict patients who required additional antiplatelet therapy (microemboli signal (MES) rate >50 hour-1: P=0.164, MW test). 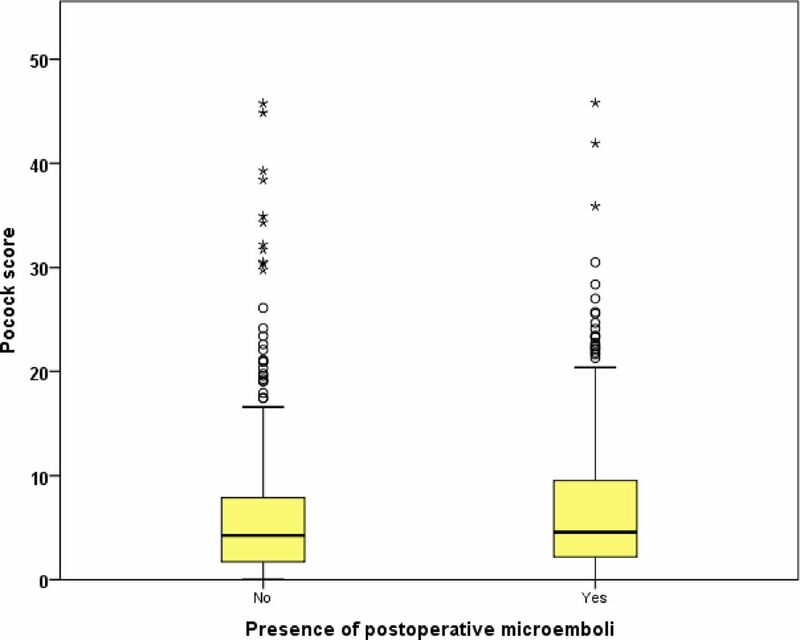 Receiver operating characteristic analysis also showed that the Pocock score predicts acute postoperative microemboli (area under the curve (AUC) 0.546, 95% CI 0.502 to 0.590, P=0.039) but not a high rate of postoperative microemboli (MES >50 hour−1: AUC 0.546, 95% CI 0.482 to 0.610, P=0.164). A Pocock score ≥2.3% showed a sensitivity of 74% for the presence of acute postoperative cerebral microemboli. A Pocock score ≥2.3% also showed a sensitivity of 77% and a negative predictive value of 90% for patients who developed a high microembolic rate >50 hour−1 after carotid surgery. Conclusion These findings demonstrate that the Pocock score could be used as a clinical tool to identify patients at high risk of developing acute postoperative microemboli. The Pocock cardiovascular score was developed to predict the 5-year risk of death from CVD. The score was derived from cardiovascular risk factor data from 47 088 participants from eight published randomised controlled trials of antihypertensive treatment.4 The Pocock score has the advantage of including weightings for the presence of clinical vascular disease.4 Therefore, it is the most suitable CVD risk score to assess the cardiovascular risk factor burden of patients with symptomatic carotid artery disease. There is no current evidence on whether composite cardiovascular risk scores are associated with the presence of microemboli. Additionally, there has been no attempt to associate the severity of cardiovascular risk at baseline with ­occurrence of postoperative microemboli in patients undergoing CEA. Microemboli present acutely after carotid surgery are associated with an increased risk of postoperative stroke syndromes.7 However, the current gold standard, TCD imaging, is not widely available in clinical services.8 We therefore aimed to explore whether the Pocock cardiovascular score is helpful in predicting the risk of cerebral microemboli acutely after CEA. Pocock scores were calculated using the online calculator (http://www.riskscore.org.uk/). The risk score is an integer, with points added for each cardiovascular risk factor. The risk score includes age, gender, systolic blood pressure (BP), serum total cholesterol, height, creatinine, smoking, diabetes, left ventricular hypertrophy, history of stroke and history of myocardial infarction.4 The 5-year risk of death from CVD for scores of 10, 20, 30, 40, 50 and 60 was estimated as 0.1%, 0.3%, 0.8%, 2.3%, 6.1% and 15.6%, respectively.4 The Pocock risk score is based on a large cohort of randomised controlled trials in different countries with reliable follow-up and has been validated.4 Therefore, the risk estimates are more precise in patients with clinical vascular disease than other risk scores.4 It is therefore a suitable CVD risk score with which to assess the cardiovascular risk factor burden of patients with symptomatic carotid artery disease. All the postoperative outcomes were defined based on recommendations of the UK intervention Audit Steering Committee of the Royal College of Physicians.11 We defined cumulative major events as the combination of perioperative stroke or transient ischaemic attack, myocardial infarction and death, and cumulative minor events as the combination of neck haematoma and cranial nerve injuries. CEA was performed as previously reported.12 Aspirin 75 mg oral, clopidogrel 75 mg oral or the combination of both antiplatelet agents in these doses was given before carotid surgery. The decision on preoperative antiplatelet treatment was made by the individual surgeons. Overall, 4 patients were on preoperative anticoagulation, 383 patients were on single antiplatelet agent preoperatively, 270 were on dual and 13 were on triple antiplatelet agents preoperatively. Shunting was performed if the patient developed focal neurological signs when CEA was performed under local anaesthetic; or in those cases performed under general anaesthetic when the mean velocity in the middle cerebral artery dropped by >50%. All patients received intravenous heparin (40 units/kg) prior to the cross-clamp phase of the CEA. In our study, 465 patients underwent CEA under general anaesthesia and 205 patients were under sedation and local anaesthesia. TCD monitoring13 was performed (PC Dop 842, SciMed, Bristol, UK) with a 2 MHz probe focused on the middle cerebral artery ipsilateral to the stenotic carotid artery. A head-frame was used to secure a constant angle of insonation during the TCD monitoring. Doppler signals were obtained within the depth range of 55–64 mm and time-averaged mean velocity in the region of 55±12 cm/s. We used a single channel and a filter set to a low threshold to capture all possible signals. The recorded ultrasonographic images were then assessed to differentiate artefacts from microemboli based on the criteria of the International Consensus Group on microembolus detection.13 Monitoring was performed for a minimum of 30 min following skin closure. Our vascular technologists in this study had at least 5 years of experience of TCD,14 and our observers have 90% agreement with software validated against a panel of international experts.15 The microemboli13 rate was calculated at 15 min intervals. Previously, we added dextran-40 treatment in patients with microemboli signal (MES) rate >50/hour-1 6. Following our previous work on tirofiban9 14 16 (Aggrastat; MSD, Hoddesdon, UK), we have stopped using dextran-40. Currently, all the patients with MES rate >50/hour-1 6 are given tirofiban intravenously 0.4 μg/kg/min for 30 min, then 0.1 μg/kg/min for 18 hours. Institutional approval was granted. The Research and Development Department at University Hospitals Coventry and Warwickshire NHS Trust (the host institution) confirmed that regional research ethics committee (REC) review was not required under the harmonised Governance Arrangement for REC for research17 because this study was considered part of service evaluation. Therefore, patient consent was not required for this study. Statistical analyses were conducted using SPSS V.19. Parametric data are expressed as mean and SEM. Non-parametric data are expressed as median and IQR. Non-parametric unpaired data were analysed using the Mann-Whitney (MW) U test for between-group comparisons. Categorical variables were analysed using the χ2 test or Fisher’s exact test. A P value of less than 0.05 was considered significant. All the patients included in this study were eligible for Pocock score estimation as high-risk patients with clinical CVD. For the analysis, a score of ≥2.3% is taken as the threshold for ‘high risk’ patients. The association between microemboli and Pocock risk scores ≥2.3% was analysed using the receiver operating characteristic (ROC) curves. Between January 2002 and December 2012, 670 patients were included (mean age: 71±1 (SEM) years, 474 (71%) male and 652 (97%) Caucasian). Co-morbid conditions at baseline and indications for CEA are listed in tables 1 and 2. CEA was undertaken in 474 (71%) patients for symptomatic disease and in 196 (24.8%) for asymptomatic carotid stenosis. Of the 670 patients, 74% were hypertensive, 71% were smokers and 49% had hypercholesterolaemia (table 1). The mean systolic BP was 145±1 (SEM) mm Hg, the mean diastolic BP was 74±1 mm Hg, the mean body mass index was 27±0.2 kg/m2, and the mean total cholesterol was 4.6±0.1 mmol/L. Following CEA, 335 (53%) patients developed acute postoperative cerebral microemboli. Eighty-six (13%) patients developed sustained high microembolic rate (MES >50 hour−1), for which additional antiplatelet therapy was administered to reduce risk of postoperative stroke, as per the department’s standard protocol, using an intravenous tirofiban infusion.9 The overall 30-day mortality was 1.9% (13/670 patients), and 30-day morbidity included cerebrovascular accident or transient ischaemic attack in 16 (2.4%), myocardial infarction in 9 (1.3%), neck haematoma in 24 (3.6%) and transient cranial nerve injury in 34 (5.1%) patients (table 3). The cumulative 30-day major event rate was 4.3% (29/670) and minor event rate 8.4% (56/670) (table 3). Patients with evidence of cerebral microemboli acutely following CEA had a significantly higher Pocock score at baseline (microemboli 4.6% (2.2–9.5) vs non-microemboli 4.2% (1.7–7.9), P=0.03, MW test; figure 1). The Pocock score was not significantly different between those who developed a sustained high MES rate >50 hour-1 acutely following CEA requiring additional antiplatelet therapy (tirofiban infusion) and those who did not (P=0.164, MW test). ROC analysis for Pocock score showed accurate prediction of the presence of acute postoperative microemboli (area under the curve (AUC) 0.546, 95% CI 0.502 to 0.590, P=0.03; figure 2). However, the score did not predict those with an MES >50 hour−1 for whom we routinely employ additional antiplatelet therapy (AUC 0.546, 95% CI 0.482 to 0.610, P=0.164). We used a Pocock score of ≥2.3% (which is equal to a score of 10 points) or ≥6.1% as potential cut-off points in identifying those who are more likely to develop microemboli (tables 4A,B and 5A,B). A Pocock score of ≥2.3% showed a relatively high sensitivity (74.37%) for the presence of acute postoperative cerebral microemboli. It also showed high sensitivity (76.7%) and negative ­predictive value (89.5%) for patients who developed a high ­microembolic rate >50 hour−1 (tables 4A,B and 5A,B). Difference of Pocock score between 355 with postoperative microemboli and 315 without postoperative microemboli who underwent carotid endarterectomy between January 2002 and December 2012. 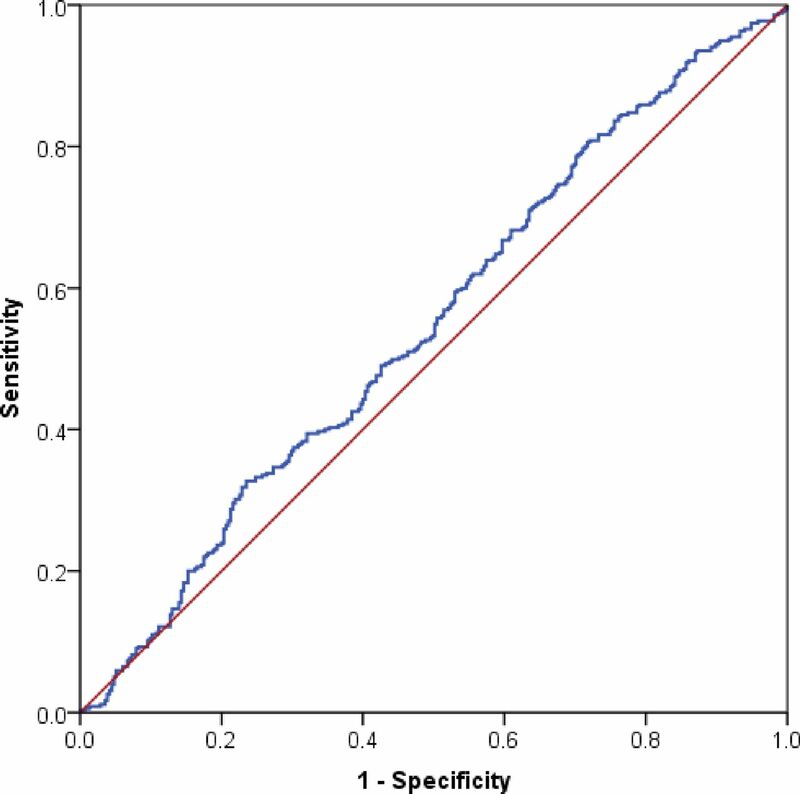 Receiver operating characteristic for Pocock score against presence of microemboli acutely following carotid endarterectomy (n=670) (area under the curve 0.546, 95% CI 0.502 to 0.590, P=0.03). Stroke, especially in the immediate postoperative period, remains one of the most important complications following successful CEA. The main mechanisms leading to stroke include postoperative hypertension causing hyperperfusion syndrome and thromboembolism from the endarterectomised area or elsewhere. ­Hyperperfusion syndrome is uncommon and strict postoperative BP control with the provision of written guidance has been shown to minimise this.18 TCD remains the only proven method of predicting post-CEA thromboembolic events.19 Multicentre studies have confirmed that acutely persistent ­microembolisation is associated with a significantly higher short-term stroke risk.6 12 20–23 Clinically, it is unclear which patients will develop acutely persistent microembolisation post carotid surgery. Surgical technical error is not common as a main cause of microembolisation.24 Patients who have undergone staged bilateral CEA have been shown to have similar rates of postoperative microembolisation.25 A randomised clinical trial has also reported that a high rate of postoperative embolisation was unrelated to carotid patch type.26 Additionally, observational studies27 28 have suggested that ­­postoperative microembolisation is more common in women, which goes against technical error as being the main culprit. To date, the most promising theory has come from Hayes et al,29 who showed that the high rate of postoperative microembolisation reflected physiologically increased platelet reactivity. Therefore, the cause of the postoperative microembolisation may be related to the inherent characteristics of the patient or the atherosclerotic disease process itself. To date, the association between classical cardiovascular risk factors and ­microemboli acutely following carotid surgery has not been studied. Therefore, a clinical scoring system that would predict the risk of postoperative microemboli would be useful if the outcome were either stroke/TIA prevention by increasing perioperative treatment and/or by longer term strategy to reduce the severity of factors within the Pocock score contributing to the increased stroke/TIA risk. One of the key findings of our study is that Pocock score shows an association with the presence of postoperative microemboli. A Pocock score of ≥2.3% was shown to have high sensitivity regarding the presence of microemboli and high negative predictive value regarding a microembolic rate of >50 hour-1. This cut-off point could possibly be employed to guide postoperative TCD monitoring where it is not routinely available and could help identify patients where a more aggressive strategy of cardiovascular risk factor reduction could be employed. However, the association of Pocock score with a high rate of postoperative microemboli requiring additional antiplatelet agents was unclear in our cohort, as the score was not significantly associated with an MES rate of >50 hour-1 when ROC analysis was used. This could be confounded by the fact that the majority of patients in our cohort were already on dual antiplatelet therapy (aspirin and clopidogrel). Payne et al 30 demonstrated that dual antiplatelet agents are effective in minimising the occurrence of postoperative microemboli. A more recent study31 reported that with routine use of preoperative dual antiplatelet treatment, the requirement of postcarotid surgery TCD monitoring to identify patients who are at risk of developing thrombotic stroke could be significantly reduced. Taking into account our findings and the aforementioned data on dual antiplatelet therapy, we could argue that postoperative TCD can selectively be used in those with a Pocock score ≥2.3%, given that they already receive dual antiplatelet agents. A multicentre prospective observational study is obviously needed to prove and validate this hypothesis. The proportion of patients who developed microemboli acutely following surgery was similar to a previously published study in a different centre.34 Another limitation is the lack of long-term follow-up data. However, this was not part of the study’s objectives. A raised Pocock score has an association with and high sensitivity for the presence of microemboli acutely following carotid surgery. These findings suggest that the Pocock cardiovascular risk score could potentially be used as a clinical tool to identify patients who are at increased risk of developing acute postoperative microemboli. Anon. Joint British recommendations on prevention of coronary heart disease in clinical practice: summary. British Cardiac Society, British Hyperlipidaemia Association, British Hypertension Society, British Diabetic Association. BMJ 2000;320:705–8. Carotid Interventions Audit Group. Royal College of Physicians, ed. UK carotid endarterectomy audit. London: CIAS Group, 2012.
. Consensus on microembolus detection by TCD. International Consensus Group on Microembolus Detection. Stroke 1998;29:725–9.
. Tirofiban. A review of its use in acute coronary syndromes. Drugs 1998;56:1067–80. https://www.hra.nhs.uk/planning-and-improving-research/policies-standards-legislation/governance-arrangement-research-ethics-committees/. accessed 28 Feb 2018. Contributors MS and DRJS conceived the study. All authors were responsible for the design and execution of the study. MS, AS and RWSL were responsible for data collection and data analysis. DRJS, CEH and CHEI are guarantors. Ethics approval Research and Development Department at University Hospitals Coventry and Warwickshire NHS Trust.